Lokha Samastha malayalam movie directed by debtante Sajith Sivan featuring Aju Varghese and Kalabhavan Mani in lead is currently undergoing shoot. Anu Mohan, Joy Mathew, Suraj Vennjaramoodu, Ganesh Kumar and Kottayam Nazir, Madan Mohan will also give life to prominent character in this movie. 'Loka Samastha' is produced by Ajayan Trippannur and Madhu S Nair under the banner Trippannur Shiva Creations. The screenplay is handled by N R Suresh Babu. Versatile actor Kalabhavan Mani is having a good time in the film industry with more projects coming in his way. After performing in 'Chakkaramampazham' and 'Gunda', Mani is donning the lead role in Sajith Sivan's directorial debut 'Lokha Samastha'. The movie will feature Aju Varghese, Anu Mohan, Joy Mathew, Suraj Vennjaramoodu, Ganesh Kumar, Kottayam Nazer and Madan Mohan in prominent roles. 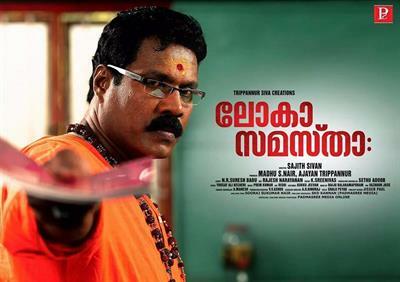 'Lokha Samastha' is produced by Ajayan Trippannur and Madhu S Nair under the banner Trippannur Shiva Creations. The screenplay is handled by N R Suresh Babu. For the lyrics of Yusafali Kecheri, the music is set by Prem Kumar. The camera is helmed by Rajesh Narayanan. This feel good movie would a complete entertainer creamed with all essence to keep the moviegoers intact. The malayalam film industry has always given space for new filmmakers, technicians and actors to show their skill. With half way gone, the number of movies released in 2014 has gone past the 100 while a long line of projects are undergoing production works. There had been a radical change in the viewership of young moviegoers who are more concerned about their time. Even though the arrival of new comers has given an extra power in filmmaking, but many could not satisfy the interest of the movie lovers. As script is the king, scriptwriters should give prime importance in crafting rather than trying to experiment with it. Many multi star projects which got released could not get the support of the viewers for its half baked stories and loose screenplay. Some of the most anticipated movies which would reach theatres in 2014 include mega budget ventures and those wish unique storyline. The awaited movies of the year include Peruzhazhi,Manglish,Vikramadithyan, Sapthamashri Thaskara, Laila O Lailaa, Double Barrel, Iyobinte Pusthakam, Little Superman 3, Mili and Otta Madaram. The list continues with Puli Murukan, Rajadi Raja, Amar Akbar Antony, Enthoru Bhagyam, Hai I am Tony and Money Ratnam.